We are able to access some of the finest plants to come out the world famous Pistoria region of Italy. We will have a dedicated tunnel of plants on display that you are welcome to visit or buy from at significant savings. Just give us a call to arrange a visit. A PDF or excel version of the weekly looking good list can be found in the Looking Good section of this website or can be obtained by contacting our team. 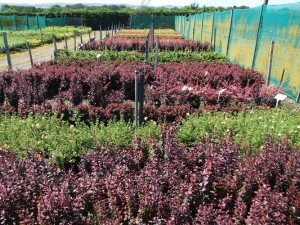 Rainbow Plants grows hardy nursery stock. There is usually good stocks of Pieris, Azaleas, Camellia’s, Phormiums, Corylines, Leylandii and Castlewellan (well someone needs to grow them!) and all the other A to Z that a Garden Centre needs. 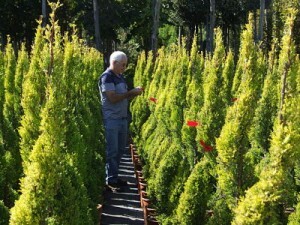 Wide ranges of ornamental trees are also grown. We supply Garden Centres in the South West Peninsula from Bristol on the North, to Redruth in the West, to Weymouth along the south coast. Deliveries are made on Danish Trolleys using our own transport. Plants are top dressed with bark, can be labelled with a colour picture if available, pre-priced and bar-coded if requested. A Looking Good List is faxed or emailed weekly, usually on a Friday and provided the response is quick enough we endeavour to deliver the same week. The list is an honest attempt to bring to your attention plants that will appeal to your customers. The labels can contain a picture of the plant to boost identification for the retail customer and has a ‘Grown in the South West’ logo for regional promotion and knowledge. Explore our plant lists and full catalogue.